NEW! 4-Block Walk to Beach from Bay St. Louis Apt. 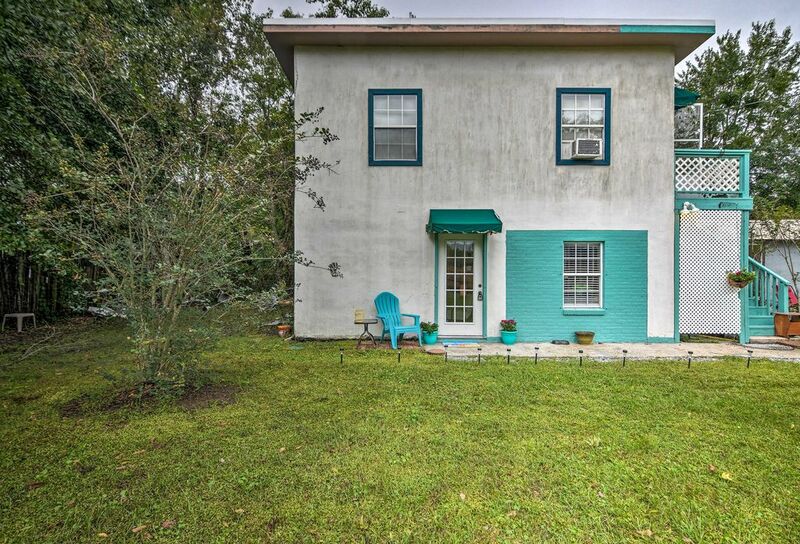 The beauty of the Gulf Coast awaits at this cozy 1-bedroom, 1-bath vacation rental in Bay St. Louis. Located on a large, lush lot only a short 4-block stroll from the beach and minutes from downtown attractions, this remodeled apartment for 8 is perfect for families seeking, sun, surf, and serenity. This acclaimed tourist town offers several annual events and sits just 1 hour from New Orleans! Offering a beach theme and spa-like colors, this newly renovated apartment boasts a soothing ambiance that you're sure to enjoy! Relax in the living room after a day of fishing. As you lounge on the futon and watch your favorite movie on the flat-screen antennae TV with a DVD, try not to be distracted by the delicious cuisine being cooked in the well-equipped kitchen. With top-notch appliances, ample cookware and dishware, and several countertop appliances, the kitchen has everything you'll need to dazzle your friends with your culinary capabilities. If you prefer grilling to sauteing, head into the large yard and throw some burgers on the charcoal grill. While the food sizzles and the adults relax at the dining table for 6, the kids can play on the large playset! The large bedroom features a queen bed and twin bed with a twin trundle, making it perfect for families of 4 to rest your sore swim legs. Four additional guests will find comfortable sleeping accommodations on the living room futon and 2 cozy cots. Voted one of 'America's Coolest Small Towns' by Budget Travel Magazine, Bay St. Louis offers over 100 brand new boat slips, covered platforms, and gorgeous views, making it ideal for fishermen and beach bunnies. After grabbing a cup of coffee at the Buttercup Cafe, head 4 blocks down the road to the beach. You'll be able to swim, boogie board, sunbathe, and snorkel within minutes of the home. The fishermen of the group will love the top-notch trout fishing available at Rutherford Pier. The 'Second Saturday Art Festival' is sure to be a crowd-pleaser. You'll find featured artists, music, delicious food and lots of people milling about the streets as you peruse the many exhibits. If you find yourself in Bay St. Louis in early October, be sure to attend the Annual Cruisin' The Coast. With live music, a swap meet, an auto auction, and more, Cruisin' The Coast has something for everyone. You'll also be within 2 miles of the Hollywood Casino and The Bridges Golf Club at Hollywood Casino, Mississippi's only Arnold Palmer and Ed Seay signature championship golf course and the first resort course in the world to be granted the Audubon Silver Signature Status by Audubon International. If you start to crave city excitement, take a day trip to New Orleans, located just 1 hour away. - Amenities include a well-equipped kitchen, flat-screen antennae TV with a DVD player, charcoal grill, outdoor dining table, swingset, large yard, free WiFi, parking for 2 vehicles, and more!